Happy Cinco de Mayo and National Scrapbooking Day! What better day to celebrate with a Virtual Card Making Party OWH style! Let's start by celebrating some winners! Way to go girls! Email Yolanda at imaginemakeshare (at) gmail (dot) com to collect your prize. Of course the real winners are our troops. ODBD will be covering shipping for 660 cards! Woot! And a big THANK YOU to ODBD. Now for our VCMP/May challenge! In honor of Cinco de Mayo, include any five elements on your card. Post your creation right here here by June 1 to get in on the prize drawing. And the prize? ODBD is offering TWO generous $25 gift certificates for prizes! Need ideas? 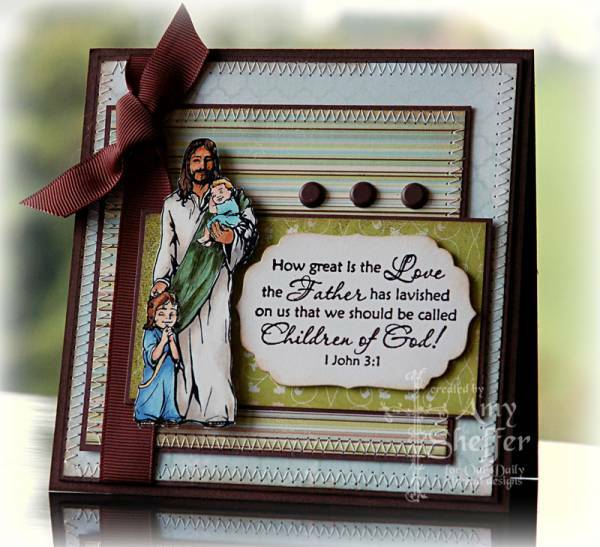 Check out these great cards from our friends at Our Daily Bread Designs. This one has 1) paper piercing 2) ribbon 3) brads 4) die cuts 5) embossing (on the die cuts). How about a little 1) stitching 2) ribbon 3) brads 4) fussy cutting 5) dimensional tape. Remember to keep your cards A2 size for OWH purposes unless they are Any Hero cards. I am in shock.. I just checked in to see what kind of card to make for the challenge this month and WOW there's my name as a winner. I am thrilled. Thank you ODBD and especially THANK YOU for your support of our troops through OWH!